Ensuring effective corporate compliance in challenging immigration environment. OnBlick HR keeps your company compliant by digitizing I9 Form, I-983 Form and PAFs. Based on your hiring practices it also recommends matching SOC codes and Wage levels for the LCA. Get an overview of the workforce and upcoming events. Timely alerts notify the updates and pending actions. Complete the required actions and keep your organization compliant. Unique intelligent algorithm suggests appropriate SOC codes and understands the probability of approval for your H-1B cases. It also recommends the appropriate wage levels. Public Access Files are automatically generated and saved. No more hassle in maintaining Public Access Files. Keeps you Audit ready. Initiate and manage H-1B Petition. Track the status changes and upload related documents, you can now download and share these documents when required. The Automated I9 process simplifies I9/E-verify filings. 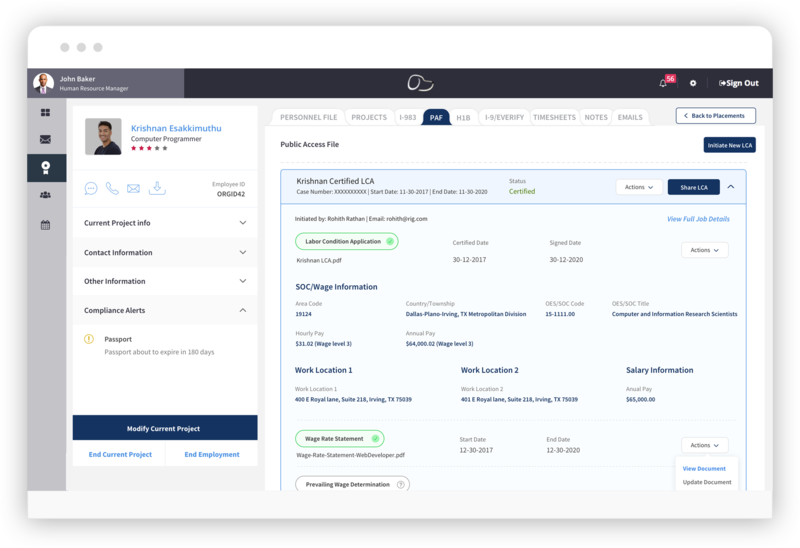 Timely Alerts ensure I9 Form is up-to-date with work authorization changes and such changes are tracked through Audit trails. Understand Speciality Occupations, recommend SOC codes and wage levels by staying up-to-date with ever changing laws. Onboard seamlessly & Demonstrate right to control. Streamline employee Onboarding process by capturing all personnel files to demonstrate right to control. Automate I9 Form/E-verify, PAF, I-983 Form & H-1B processes. Maintain audit trails and prepare for any critical RFEs. Improve preparedness for FDNS site visits with more than 60 parameters. Share PAF and I9 files easily when requested by FDNS/DOL officers.